This is the last part of our sourdough baking school. I hope everyone has learned something about sourdough and the baking thereof. Again this month, we have some words of wisdom from another faithful Texas Cooking reader. Ken, who lives in Texas' Rio Grande Valley does chuck wagon cooking on a commercial basis. Having to turn out a large volume of product, Ken uses a bread machine to speed up the operation. Sometimes you have to mix the old with the new. Here's some of what he has to say. 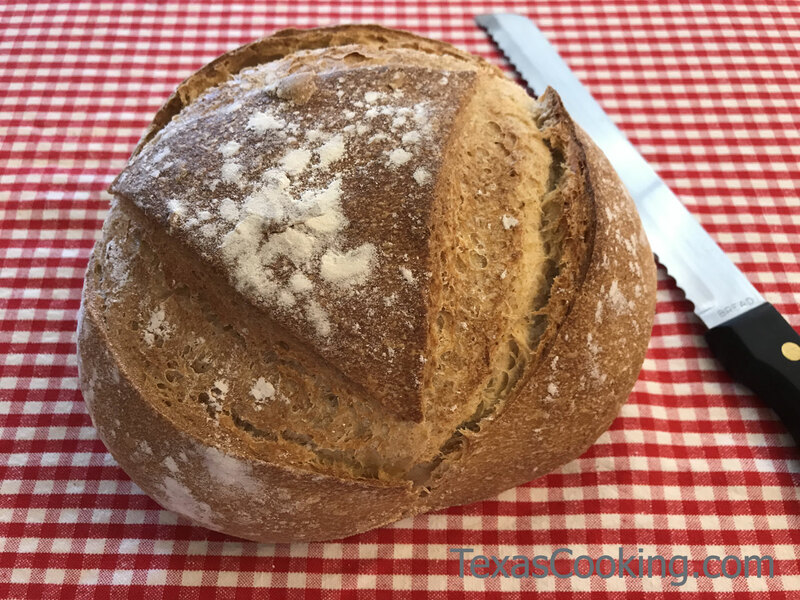 Ken doesn't use sourdough in his commercial operation, but what he has to say on Dutch oven baking will apply to the reader's sourdough recipe. One of my most complemented and asked-for Dutch oven dishes is my bread. I make it by the slab and, if they are return customers, they usually start with several slabs. I use just a standard white bread recipe for a two-pound loaf. (If I want wheat bread, I replace 1 of the 4 cups of flour with whole wheat.) A standard 12-inch Dutch oven (4 inches deep) will take 4 pounds (or two recipes) of dough. I can batch my dough faster in the bread machine, than by hand or any other mixer, usually in about 4 or 5 minutes. Just allow the machine to mix on the dough cycle until smooth and well mixed, then transfer it to a larger tub. When you have enough your two recipes mixed, knead them together and allow it to rise. After the rising, knead down the dough and place it in a well-greased Dutch oven to rise again prior to baking. I use butter for the fat in the mix and lard to grease the oven. I think lard gives the flavor that people like in the finished product. As with any good bread, allow plenty of time for a slow rise, allowing the flavors to build before baking. These loaves are usually baked in a 350-degree oven for 45 to 55 minutes. I rotate the ovens every 15 minutes to get even cooking. They should be nice and browned and sound hollow when tapped. I have a helper tip them out into my gloved hands to check the bottoms. I normally cook three or four ovens at a time, stacking them. It gives a good visual effect, and also saves about one-third on coals. I grew up on sourdough breads and love them. Now we get to the part you've been waiting for, more recipes. Combine the dry ingredients, mixing well. Combine sponge, milk and eggs, and mix well. Combine the wet and the dry ingredients, mix well, let set 10 minutes, and mix in the melted butter. Cook pancakes on medium-hot, lightly greased skillet or griddle. Makes 6 to 8 good-sized pancakes. To make them fancy, you can add blueberries or dried cranberries. All ingredients should be at room temperature, with oven preheated to 350F degrees. Cream the butter and sugar together until smooth. Add eggs and beat well. Stir in the starter, milk, chocolate and vanilla. Sift together the sifted flour, baking powder and salt. Fold into batter. Pour into two greased and floured 1-1/2x8-inch round pans or one 9x9-inch square pan. The square pan should be done in about 40 minutes, the two round pans in about 25 minutes. They are done when toothpick inserted in the center comes out clean. Serve plain or with frosting or topping of your choice. There are hundreds of sourdough recipes to be found on the Internet and in cookbooks. Everything from doughnuts to English muffins. All come from the oven with the unmistakable taste of the sourdough. After you've had a few successful baking sessions with the sourdough, you will have the urge to buy a team of mules and a chuck wagon and move back to the days of yesteryear when men were men and the women did most of the work. From time to time the mysterious Herman and ethnic Friendship recipes come up. They are just mostly sweet sourdough recipes given a twist. They are all good, so give one of them a try. Baking is very good therapy for anything that ails you. Measuring and mixing takes your mind off your problems. Kneading the dough is very relaxing once it comes together and stops sticking to your fingers. And, once you start baking, the heavenly aroma that fills your home says "Welcome and Peace" to all who inhale it. We're going to wrap this up with a couple of recipes that are fried and not baked. Don't run off screaming about your cholesterol; fried food in moderation never hurt anyone. Prepare your biscuit recipe in the usual manner. Shape the biscuits into a slightly smaller size than usual, just a little bigger than a golf ball. In a large, heavy pot or Dutch oven, bring about four inches of oil or shorting up to 350 degrees. Use a candy or deep-fry thermometer. Carefully slip the biscuits into the hot oil. Don't splash none on yourself. Don't crowd the biscuits. Spoon hot oil on the tops and rotate the biscuits so they brown evenly. When they are golden brown they are done. Drain in a nest of paper towels, and keep them warm in a slow oven if you are cooking a bunch. Lightly dredge the steak pieces in the seasoned flour, and shake off the excess. Dip the floured steak in the starter and then back in the flour to get a good coating. Place the coated steak on a cookie sheet and let it rest about 15 minutes before frying. This gives the coating time to set. Fry in about one inch of hot oil until golden brown. We hope this series brings you up to speed on the now demystified world of sourdough. It has been enjoyable researching this piece, and our thanks to John and Ken for contributing to our book of knowledge.